Late in the summer of 1988, I embarked on the longest journey of my life, in terms of both distance and time away from home. It was the first time that I needed a passport. Professionally, it marked my first exposure to the latest type of character generator. 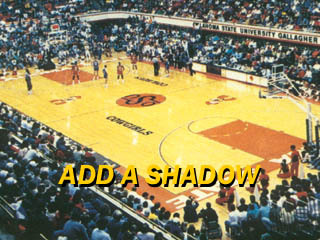 And it resulted in a first-class professional honor. It's been a year since I've written you. I had planned to send you a Christmas card but never got around to it. I'm enclosing the intended card as proof. As to why it's in Korean: NBC has hired me as one of 30 Chyron operators who will travel to Seoul for the 1988 Summer Olympics. Along with 363 other freelance technicians, we're scheduled to start work September 4, spend two weeks getting ready and two weeks telecasting the Games back to this country, and return on October 4. According to a preview in Time magazine, we freelancers were among a total of 1,100 NBC staffers who would be involved in the biggest remote in NBC Sports history. 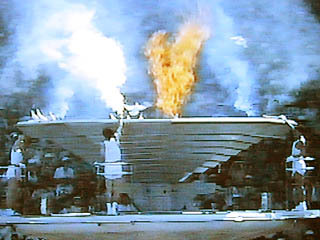 It was the network's first Olympics since 1964. The 30 of us who were Chyron operators would have to learn how to run a brand-new graphics machine, the Sports Cypher, made by the British company Quantel. Yes, Seoul should be quite an experience; but maybe not the same sort of experience that you had when you visited Japan as a high-schooler. For you, becoming acquainted with a different culture was the whole point of the trip. My purpose will be to help in producing 179½ hours of American television. So I won't be interacting much with Koreans; instead, I'll be with NBC people all the time. Starting next week, we'll work seven days a week in TV trucks shipped over from the States or in our specially-built Broadcast Center. American food will be provided. NBC drivers will shuttle us around the city in vans. When we're off duty, we'll stay in the NBC section of the specially-built Press Village. Heavy security will keep out anyone who doesn't belong. We'll be in Seoul to work, with few if any days off. It doesn't bother me that I won't see much of the "real Korea." I feel a little uncomfortable in foreign lands, like New York City or Canada. I feel like an outsider, which of course I am. Actually, those are the only foreign countries I've visited (New York City and Canada). At least they're a lot like the United States. Except for Quebec, where all the signs and much of the conversation are in French; but I'm getting used to that, from visiting Montreal for baseball telecasts. After a month in Korea, maybe I'll even have developed a taste for kimchi. We'll see. My journey to Seoul took a full week. On Friday, August 26, I left my car parked at my apartment, and my father dropped me off at the Pittsburgh airport. I took a 9:45 am flight to Houston, where I worked two Pittsburgh Pirates games for KDKA-TV. On Sunday, I flew from Houston to Cincinnati for three more Pirates telecasts Monday through Wednesday. Finally, on the morning of Thursday, September 1, I left Cincinnati bound for Portland, Oregon, and then for Seoul, arriving there in the evening of Friday, September 2. Since these final two legs would require more than 18 hours and cross ten time zones plus the International Date Line, I decided to try to minimize jet lag by readjusting my mental clock  if not my body clock  during the course of the trip. To gain 14 hours, I could have tried to make my mental clock run 35% faster (54 fake hours in 40 actual hours). But we humans tend to distort time in the opposite direction, staying up past our bedtimes and getting up late the next morning. I decided it would less disruptive to first "cross the Date Line" by setting my mental clock ahead by a full day, and then to let it run 25% slower (30 fake hours in 40 actual hours). Click here for more pretense that one day can be more than 24 hours. I kept my wristwatch on real time, of course, but I had another virtual clock (actually a conversion table on an index card) that I set back 15 minutes every hour. Let's call that Fake Standard Time, or FST. I pretended that the time of day on this very long Thurfriday was actually FST. Upon arriving in Seoul and clearing customs, we checked into our rooms at the Press Village. 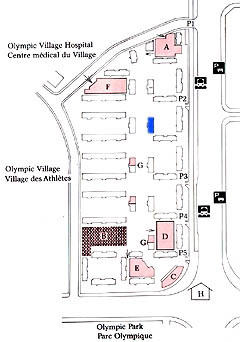 This was a complex of multi-story buildings, located adjacent to the athletes' Olympic Village. After the Games, these buildings would become apartments. 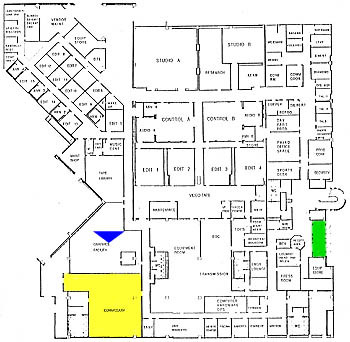 For 32 days, my home was room 2A (a single bedroom) in unit 202 of building 124 (highlighted here in blue). We entered and exited the Press Village through the accreditation center A. Sometimes we ate at the press cafeteria B. 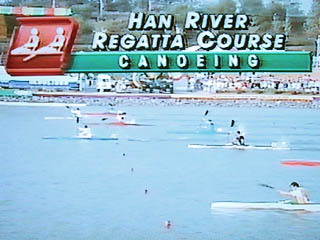 The brochure described the accommodations and amenities at the Press Village as equal to or better than that of a hotel. However, the hotel they surveyed was located in Tijuana. The bedsheets in the Press Village were paper, the towels non-existent, safe deposit boxes and closet space inadequate. However, the Press Village had its fun moments, too. And that's the true spirit of the Olympics. After all, we are all amateurs. In my room, I found this welcome disk. It had been made by 15-year-old Lee Yi-Jung of the Yang-Dong Middle School "as part of the arts and cultural events commemorating the Seoul Olympic Games." 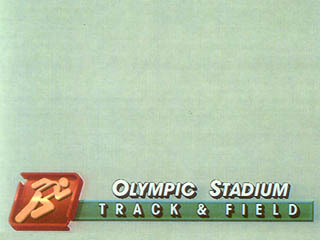 The mascot for the games was a cartoon tiger called Hidori. Click here for a picture. The Village was near some of the athletic venues in the southeastern part of the city, but I wouldn't be working there. Instead, I was assigned to the International Broadcast Center (IBC), on Yoido Island some 12 miles to the west. I rode a bus across town every day. NBC's headquarters in the IBC covered about 62,000 square feet, including two live control rooms, two studios, 15 edit rooms, and numerous offices and other facilities. My home base was one of six Cypher keyboards located in the graphics center. As I recall, I was in the center of the second row of Cypher stations, at the blue arrow. Other key areas at the IBC were the commissary (yellow) and the main entrance (green), where our credentials were scrutinized each day. I had been hesitant about accepting NBC's invitation because, as with every Olympics since 1972, security was a major concern. 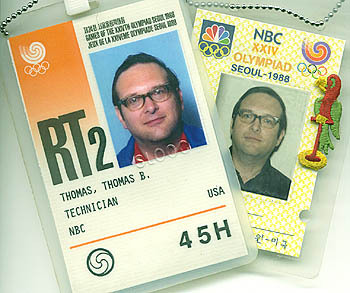 Our credentials were essential during working hours, but a security memo reminded us, "Do not wear your credentials or clothing marked with NBC insignia during off-duty hours, most particularly in the city streets of Seoul." Aside from the influx of foreigners for the Games, the Koreans had other security worries because the hostilities of 1950-1953 had never officially ended. Technically, North Korea and South Korea are still at war. So, for example, we weren't allowed to take pictures in certain directions because there were military installations over there. The souvenir on the right was salvaged when a control room at the IBC was being dismantled. It's a label for a video monitor, identifying the source as "character generator page 1." Another souvenir was this half-inch-square NBC pin. And now here comes a semi-technical discussion of my work with the Cypher character generator, which is now obsolete. If you'd rather skip down to topics of more general interest, click here. In the early years of television, text superimposed over a picture tended to disappear, either because the color of the letters was too similar to the underlying picture or because the detail in the underlying picture overwhelmed the letters. 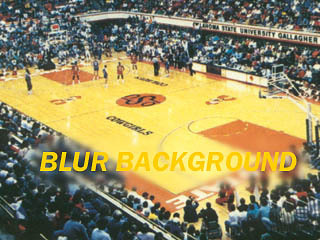 When I was in high school, I thought that maybe the underlying picture could be defocused in the area where the lettering was to go. This does indeed help a little, as you can see in this simulation. But it would be technically difficult to accomplish, and it doesn't do anything about the similar colors. The method that was actually used in the 1980s was to add an "edge" to the letters: either a drop shadow or a border, using a contrasting color. This blocked out more of the busy underlying picture. Moreover, if the letters and the picture happened to be the same color, you could still read the letters from their contrasting shadows. A better solution would be to add a bar behind the letters, either opaque or semi-transparent. This method is used almost exclusively nowadays. However, the graphics machines of the 1980s were not designed to do it very well. This changed when two new machines appeared: Quantel's Cypher, which we used at Seoul, and Chyron's Infinit, which I still use today. The Cypher's capabilities allowed our designers to create this "look" for the 1988 Olympics. The hardware, software, and graphics design were still being updated until, a couple of months before we arrived, the development work was frozen so that NBC's operating procedures could be finalized. Quantel engineers, led by project manager Jon Smith, were at the IBC to help us handle the new beast. Also, notice that most letters had a black edge, even if they were superimposed over a solid background bar. Nowadays, almost all text has a background and is unedged, like the GBR tricode in this example. Some of our Olympic designs were too far ahead of their time. 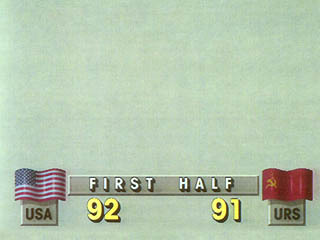 This basketball scoreboard put the numbers side by side, as they are in most arenas, but we had to come up with another plan because TV producers and viewers preferred to see one number above the other. 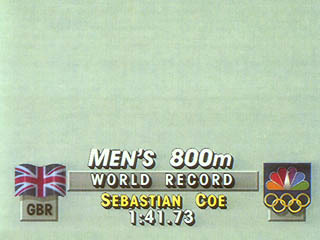 Only recently have side-by-side scores returned to TV graphics, in the form of the "Fox box" strip at the top of the screen. The Cypher had much better picture quality than the Chyron I had been using, especially in logos like the national flags. Its hard disk was much larger, and its removable media were large-capacity Bernoulli cartridges rather than the eight-inch floppy disks that I used in the States. It had an interface to the scoring computer system. It could do three-dimensional effects similar to the Infinit's "transforms," and it could do them in real time. I remember idly spinning the keyboard's trackball to make a logo spin on the screen. But there were some problems. In answer to a questionnaire at the end of the Olympics, I wrote, "The present software is rather slow; for example, there may be a second's delay in transferring a preview page to air. 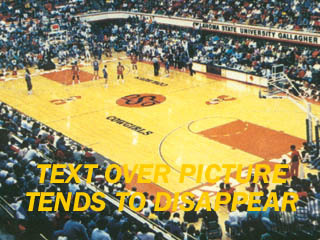 More preparation is required than on a Chyron for certain operations, such as droplines (one must build a set of macros to be able quickly to add standard lines below an athlete's name) and effects (there are no built-in effects like wipes or slow reveals or a dissolve between channels)." The operator's monitors showed the two video outputs of the Cypher. In general, if the operator wanted to see his cursor, he had to make it show up on one of those video outputs, which meant that the viewers at home might be able to see it as well. I suggested that, like Chyron, there should be a separate "edit" output for the operator's use only. "Have a simple character generator that produces the cursor plus a box outlining the safe title area. Key this generator over whichever video output the cursor is supposed to be on, and feed the composite to the corresponding operator's monitor (1 or 2). Now the cursor can't appear on air. And much of the flashing is eliminated, because there's no need to re-display the pic [that is, render the image all over again] simply because the cursor has moved. The safe-title box would also help to identify which channel the cursor is on." Some of the operators in Seoul had been using the Cypher for months. Four of them were assigned to train me and the other 18 new arrivals. We newbies had varying degrees of experience and expertise. It seemed like a bit of a gamble to send us across the ocean to learn a brand-new system in less than a week and then to put us on the air for a major network. But things worked out okay. It wasn't hard for me to grasp the Cypher way of thinking; and although the machine had its faults, it could be tamed. We trained for four 12-hour days from Sunday through Wednesday, September 4 through 7, ending with a party at the field shop down the street. Then we began our "daypart" schedules the next day. I generally went to work in the morning, maybe at 9 am or at noon, and came home at 9 pm or midnight. Of course, those were Seoul times. Our American viewers were on the opposite side of the world. So when I came to work in the morning, Bryant Gumbel was usually on the air hosting NBC's 7:30-to-midnight prime time coverage. Next Bob Costas would host the late night shift, from 12:30 to 2:30 am Eastern time. Then there would be a lull, and finally the Today show crew would do their thing before it was time for me to go home for the night. Bryant usually reported from an outdoor anchor position or "pagoda" some miles away, with a good view of the city. His pictures and sound were transmitted back to our broadcast center to be put on the air. And all of us had routing switchers that enabled us to look in on the feed, even when it wasn't on the air. I don't remember the precise sports involved, but once he was preparing to interview the stars of some USA team. A couple of minutes before the interview was to begin, I heard Bryant say, "You've got to be [kidding] me!" Apparently, those stars couldn't make it, and athletes from an entirely different sport had been substituted. After a moment of stunned silence, he said, "Well, give me the book." NBC had compiled all sorts of information about the athletes, and Bryant turned to that research to learn something about the total strangers he was about to interview. But he hardly had opened the book when his guests arrived. He didn't let them know that there was a problem. "Hi, how are you? Nice to meet you! Have a seat." And the interview went on the air, live, in prime time. Not knowing anything about his subjects, Bryant had to ask very general questions, so it wasn't a very good interview. But the folks at home probably didn't notice. 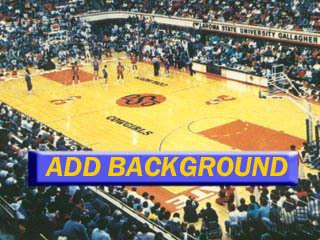 When I wasn't otherwise occupied, I watched other parts of the Games through my routing switcher, as did others in the large graphics room. I remember when the doves were released during the Opening Ceremony. Perhaps they should have been homing pigeons, which would have flown around the stadium a couple of times to get their bearings before leaving the area. But these doves didn't fly far. They kept looking for places to perch inside the stadium. A number of them chose the rim of the giant elevated cauldron. And when the torchbearers prepared to light the flame inside that cauldron, we all thought that roast pigeon would soon be on someone's menu. Fortunately, it was a broad rim, not that close to the actual flame. No feathers were singed. 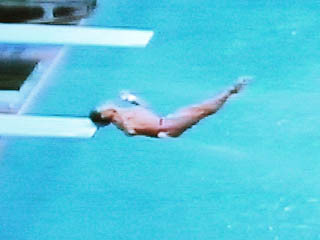 Once the actual competition began, the memorable moments included the time when Greg Louganis hit his head on the diving board. But most of all, I recall the women's 100-meter final. 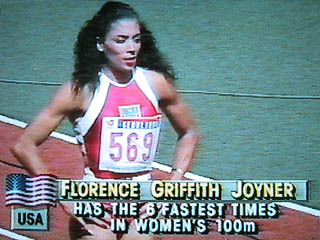 Lining up for the start, Florence Griffith Joyner looked more like a Hollywood actress than a world-class athlete. I felt as though I were watching a scene from a movie. Our heroine, with her perfect hair and nails and makeup and jewelry, was in the Big Race. 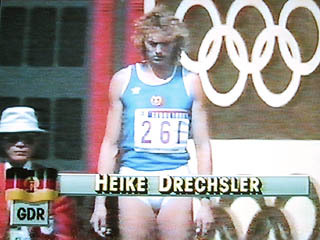 Her competition was a cast of extras, including a decidedly unglamorous challenger from communist East Germany. 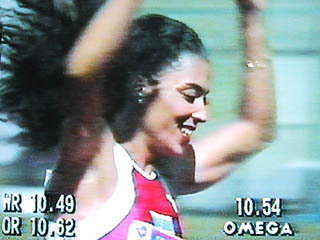 Flo-Jo won easily in Olympic-record time. The happy ending to this slice of drama almost seemed like it had been scripted from the beginning. Being stationed at the International Broadcast Center, I was like a utility infielder. I wasn't assigned to a regular sport, but I was called on to provide graphics as needed for various "minor" sports like cycling. I didn't have to travel to the velodrome. The pictures were piped back to the IBC and the graphics added there. I also prepared a lot of "slates," not intended for broadcast. An editor would include a slate at the beginning of his taped package to inform others of its content, length, and so on. Since I had worked many Stateside baseball games, I had the honor of being the first to use the Cypher for a baseball telecast. Bob Costas cut to the USA baseball team for ten minutes or so if they were playing during his late-night show. Here's part of my scorecard from the Olympic baseball game between the USA and Japan, in which the starting pitchers were Jim Abbott and Takehiro Ishii. When I keep score in baseball, I write down only what I need to know for my graphics. So when Robin Ventura grounded out to end the top of the first, I wrote simply G for groundout. It didn't matter to me whether the play went 6-3 or 4-3 or whatever. 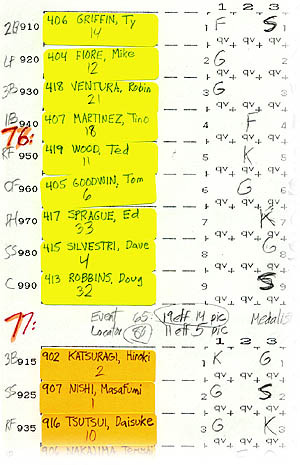 In those days, I wrote out each roster on a set of adhesive labels. When a substitute came in, all I had to do was peel off a label and stick it over the name of the exiting player that we no longer cared about. But I stopped scoring this game after the fourth inning. We were probably past the end of Costas's broadcast window, so we shut off the feed from the baseball stadium; we didn't care any more. I never used the labels for such future major-leaguers as Andy Benes, Mickey Morandini, Charles Nagy, Scott Servais, and Hideo Nomo. At the 1988 Olympics in Seoul, much of our daily life centered around food. 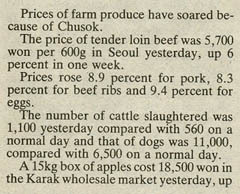 Koreans were rumored to eat dog meat on occasion. They knew that this concept offended Westerners, and they denied it. We still made jokes. For example, there was a tasty stir-fried barbecued beef dish called bulgogi which some of our NBC folks referred to as "bulldoggie." Nevertheless, our hosts almost had us convinced that their consumption of canines was a myth. But then this article on the right appeared in the English-language daily The Korea Herald. It apparently admitted that they butchered 11,000 dogs in a single day. If we multiply the rate for a "normal day" by 365, we conclude that 2.4 million Korean dogs are slaughtered annually. No, no, the newspaper said. We meant hogs, not dogs. No dogs were slaughtered. 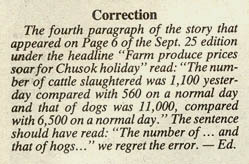 It was merely a typographical error. I was amused by the Herald's clumsy attempt to cover up a gaffe. But 30 years later, when the Olympics next came to Korea, Gus Kenworthy posted this serious message. Dogs are friends, he reminds us, not food. This morning, Matt and I had a heart-wrenching visit to one of the 17,000 dog farms here in South Korea. Across the country there are 2.5 million dogs being raised for food in some of the most disturbing conditions imaginable. Yes, there is an argument to be made that eating dogs is a part of Korean culture. And while I don't personally agree with it, I do agree that it's not my place to impose Western ideals on the people here. The way these animals are being treated, however, is completely inhumane; and culture should never be a scapegoat for cruelty. I was told that the dogs on this particular farm were kept in "good conditions" by comparison to other farms. The dogs here are malnourished and physically abused, crammed into tiny wire-floored pens, and exposed to the freezing winter elements and scorching summer conditions. When it comes time to put one down, it is done so in front of the other dogs by means of electrocution, sometimes taking up to 20 agonizing minutes. Despite the beliefs of the Korean public at large, these dogs are not different from the ones we call pets back home. Some of them were pets at one time and were stolen or found and sold into the dog meat trade. Luckily, this particular farm (thanks to the hard work of the Humane Society International and the cooperation of a farmer who's seen the error of his ways) is being permanently shut down, and all 90 of the dogs here will be brought to the US and Canada where they'll find their fur-ever homes. I adopted this sweet baby (we named her Beemo) and she'll be coming to the US to live with me as soon as she's through with her vaccinations in a short couple of weeks. I cannot wait to give her the best life possible! There are still millions of dogs here in need of help, though. I'm hoping to use today's visit as an opportunity to raise awareness to the inhumanity of the dog meat trade here in Korea and the plight of dogs everywhere, including back home in the US where millions of dogs are in need of loving homes! Go to Humane Society International's page to see how you can help. I was sick one day  I think I made the mistake of eating an apple  so I stayed home at the Press Village, listening to a baseball game on Armed Forces Radio with Ernie Harwell reporting from Yankee Stadium. Another morning before work, I listened to the radio broadcast of the Presidential campaign debate between George Bush and Michael Dukakis. Afterwards, I was curious about how Americans perceived the debate. Who won? But that information proved hard to find. I did locate an article in a newspaper a couple of days later; for some reason it was in French, but there were enough names, numbers, and acronyms for me to figure out the answer to my question. There was a TV set in the living room of the suite that I shared with several other freelancers, but I didn't spend much time there. I did join the others to see Monday Night Football with ABC's new red-black-and-white graphics and to watch the first post-Challenger launch of the Space Shuttle. 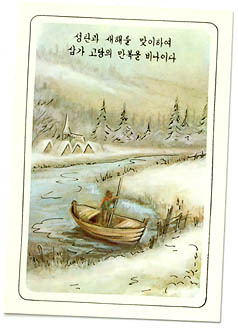 I had intended to teach myself a few words of Korean before going to the Olympics. It seemed like common courtesy to at least be able to say "thank you" to our hosts in their own language. But although I'd have no trouble saying spasebo to a Russian or arigato to a Japanese, I never was able to conquer the Korean version of "thank you." They make things too complicated; it's komapsûpnida. Every time I practiced saying those five syllables, I stumbled. I would have sounded ridiculous to a Korean. So I just stayed with English; they teach it in all the schools there, and everyone with whom we came in contact spoke at least a little English. Besides, had I mastered "thank you," the next most useful phrase would have been "good morning," and annyônghi chumusôtsupnikka was just not worth the trouble. In Seoul, I pretty much stayed around the Press Village and the International Broadcast Center. I didn't venture out in search of local Korean culture. Many other NBC folks made the tourist trip to the DMZ to stare at the North Korean guards staring back at them across the border, but that didn't interest me. Almost everyone regularly went to the shopping district called Itaewon (near the U.S. military base), looking for bargains in clothing or souvenirs, but I didn't get involved in that. It's just as well that I didn't. Many won (the local currency) changed hands in Itaewon. The district featured 1,500 shops in a street about a kilometer long, according to the article that accompanied this picture. Americans would go to Itaewon, buy a jacket, and ask to have it personalized with an embroidered name or something. As the Olympics drew to a close, the embroiderers began to get overwhelmed with work. But Koreans, being polite, hate to say no to any request. So suppose an American customer said, "Here's your money. I'm leaving for the United States this weekend; can you have the jacket ready by Friday?" The shopkeeper would answer, "Sure, no problem." The problem became apparent on Friday: "It will be ready tomorrow for sure." Some Americans got very frustrated; others had to have their merchandise shipped to them after the Olympics were over. 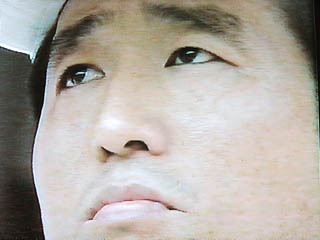 Still, I think I'd prefer a Korean's over-optimistic "no problem" to a New Yorker's rude "What, you crazy or something? No way I can do this before the end of next week. That's if you're lucky. And it's gonna cost you." As the Olympics progressed, the Koreans gradually began to feel that we at NBC were being overly rude to them and their country. They could see our coverage on Armed Forces Television, which is as easy to pick up as any of the Korean-language channels. What they expected to see was a celebration of this great event, a very proud moment in their nation's history. But they also saw stories that were not so complimentary to Korea. These ranged from an investigation of the low social status of children born to Korean mothers and American fathers, to a disturbance (NBC called it a "riot") following a boxing match. To us Americans, such reporting is commonplace. Journalism in a democracy is expected to tell all sides of a story, the bad as well as the good, the embarrassing as well as the party line. But to the Koreans, this was not a time for journalism; it was a time for celebration. One likened it to a wedding. When two people are merely thinking about getting married, it's okay to express contrary opinions, suggesting that maybe they aren't really right for each other; but such comments are out of place at the wedding ceremony itself, where misgivings should be suppressed in favor of congratulations and best wishes. I compared it to American TV's coverage of the Oscars, where you never see exposés of why the Academy members voted the way they did; or to coverage of the Miss America pageant, where documentaries about the casinos and slums of Atlantic City are never included in the telecast. But for whatever reasons, we Americans treat the Olympics partially as a news event, and the resulting coverage sometimes offended our Korean hosts. It was as if a guest had come into their home and criticized the furniture. The shopping's been great. A quote from Bob Costas: "Terry, I have one question. At the end of the show, can we run Bob Costass wardrobe by Supreme Tailors of Itaewon?" The Reebok export award has to go to Jack Bennett, with 41 pairs. The overall clothes award goes to Glenn Adamo, who went berserk at Supreme when he first got here. He was last heard shouting, "Stop me before I buy again!" The Itaewon bargains were so overwhelming that it has spoiled us for normal retail shopping. We will never, ever be able to go into a store again and pay list price. When we go into Bloomingdale's and ask "how much" and they say "$40," our response will be, "I'll give you $25, NBC discount." When we first arrived, the line for a greater discount was, "I'll bring 1,200 of my friends." As the boxing competition turned ugly, the merchants of Itaewon didn't want any of us. By the way, the word Itaewon is derived from an ancient Korean saying that loosely translates to "we'll take all your won." 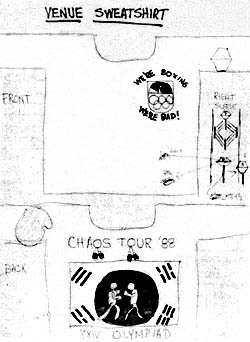 Controversy arose in Itaewon when NBC folks at the boxing venue drew up a design for a sweatshirt as souvenirs for everybody on their crew. On the front of the shirt was the NBC logo with the slogan, "We're Boxing. We're Bad!" 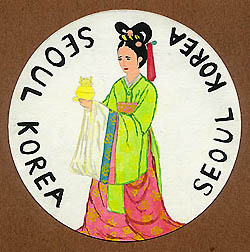 On the back, the design combined two symbols: the pictogram for boxing and the South Korean flag. The pictogram took the place of the yin-yang circle in the center of the flag, and that defacement of the national symbol turned out to be insulting to Koreans. According to The Korea Herald, four NBC employees went to a shop called the Sunflower on September 27 and showed the sketch below to the owner, Chong In-choi. They asked him to make four dozen shirts to these specifications. Chong refused. He told the newspaper, "I found the overall design and words of the sweatshirts highly critical of our country and the national flag, Taegukki." NBC spokesman Kevin Monaghn apologized, claiming that higher-ups at NBC "were upset by the T-shirts and ordered that they not be made. NBC did not intentionally attempt to embarrass its Korean hosts, who have organized a terrific Olympic Games." 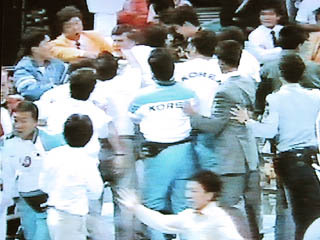 The spokesman said the words Chaos Tour 88 referred to the chaotic boxing events at the Seoul Olympics. He noted an American boxer was disqualified as he was late for a bout with a Korean boxer, that Korean boxing coaches and officials attacked a New Zealand referee, and that another American boxer suffered a broken nose after fighting two matches one night. The American television network has been criticized by Koreans for allegedly being unfair in covering the attack on the referee and two U.S. gold-medal swimmers' theft of a $900 bust from a Seoul hotel. 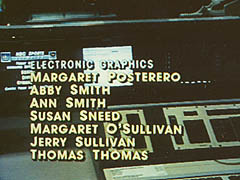 At the end of the games, NBC ran credits: the names of everyone who had worked on the telecast, superimposed over about 40 minutes of footage with music. By the time they got down to the P-through-T page of the Electronic Graphics crew, they had apparently run out of Olympics footage and were using scenes of empty control rooms. Many of our crew returned home on the same chartered flight, a 14-hour non-stop journey from Seoul to New York on Tuesday, October 4, 1988. The 747 needed a lot of runway to reach takeoff speed. It was carrying not only a heavy fuel load but also, as the captain joked, tons of luggage stuffed with clothing purchased at the shops of Itaewon. After I returned, I recovered from the Olympics rather slowly. I even stayed on Korean time for a couple of weeks, finding it more natural to sleep in the daytime and stay up all night. I could afford to unwind, because I had no assignments until a boxing show for HBO in Las Vegas on October 29. The next month, Stacey Gilmartin, the manager of graphic design, wrote to her graphics team: "It has been a month since the Seoul Games have ended, and everyone at NBC Sports is extremely pleased with the results. The most talked about and complimented aspect of these games are the graphics. You should be very proud of the job you performed for NBC. The graphics did look good, and it was people like you who made that possible. I would like to especially thank you for your patience and professionalism in learning a new piece of equipment with little time and much pressure." The following April, Howard Zryb wrote: "Hearty congratulations for being part of the graphics team that won a well-deserved Sports Emmy Monday night. You should be very proud to be part of this team that proved state-of-the-art graphics could be done in-house and that they could be done with such a flair. Everyone worked extremely hard under difficult circumstances, and I'm happy to see that our peers have recognized us for those efforts." 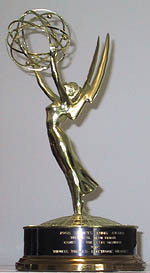 The Emmy is still on display in my apartment, reminding me of that special month in Korea.